Welcoming 2015 year with a sweet recipe Custard Halwa. 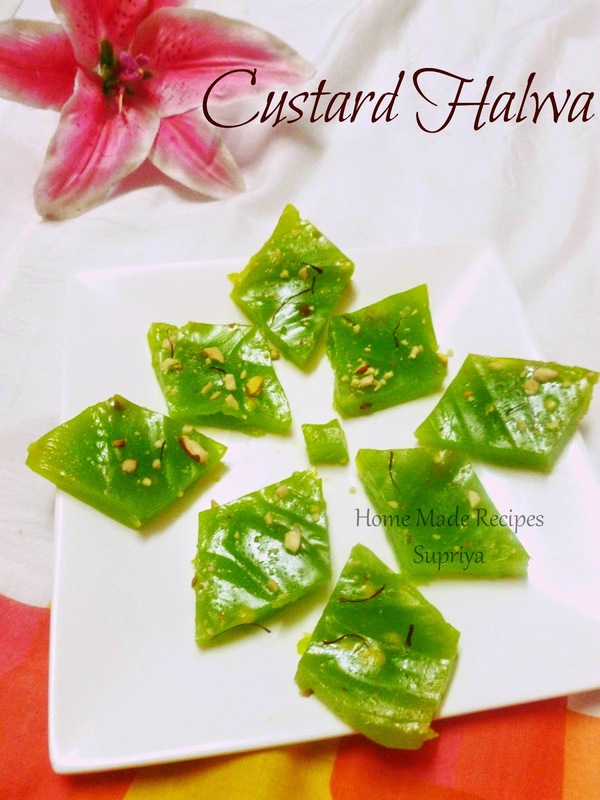 This halwa is a very quick and easy sweet recipe with less ingredients made from Custard Powder, ghee and sugar. This jelly kind of a halwa was my latest addition for my Diwali last year. Bit late in posting here. 1. Take a wide pan. Mix custard powder in water and make sure no lumps are formed. Add sugar to this and then switch on the flame. 2. Keep stirring till the mixture starts to thicken up. 3. Reduce the flame and keep stirring. Add in 5 tsp ghee and keep stirring. Mixture statrs to become glossy and translucent. It will start to form like a jelly. 4. Add in cardamom powder and nuts. You will have to keep stirring appx 10 - 12 minutes on a very low flame. Halwa will start to leave the sides of the pan and ghee starts to ooze out. Switch off the flame and pour this on a greased plate. When cooled completely , cut it into a desired shape and serve. You can also keep it in fridge to set it faster.